‘I'm Tom Benda from Czech Republic. I'm living in a beautiful historic town of Tábor with my​ family, (including) bonsai trees and kiln. I brought my first tree in 1990, that's when my​ love for bonsai started. During my "-teens" I focused more to music and girls, but around 1998 bonsai took over my time completely. Soon I needed some pots, but didn't have enough​ money to​ afford one​. So I started to think and plan about my own pots. My first pots were made in​ winter 2001/2. The dream about​ my own​ kiln came true in 2008. I started to travel with my pots and in 2011 I felt the chance to turn from garden architect into full time​ bonsai potter. 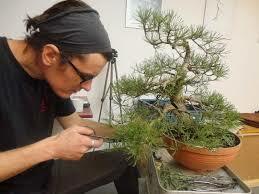 Producing high quality bonsai ceramics is now Tom’s full time job, he is one of the few potters who has been able to leave full time employment and make a career from this craft. 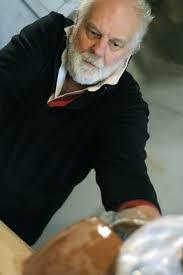 Now a highly regarded potter throughout Europe and beyond, his work is in high demand. In America, Tom’s pots are only sold by Ryan Neil, at possibly the most highly regarded bonsai nursery in the States, Mirai. When your work is this sought after, it is obviously hard to keep up with demand and please everyone, so we are delighted to be able to offer everyone an insight into Tom’s work, and a chance to acquire one of his pots.